A reliable source for Palletizers information and a resource for accessing leading Palletizers and suppliers. Palletizers, sometimes called case pickers, are machines specifically designed to load and unload pallets before and after shipping and during storage. Palletizers are technically Mast-Equipped Automated Vehicles (AVGs). Manual palletizers also exist, but more often than not, distribution and manufacturing plants use automated and robotic palletizers for loading and unloading, not manual ones. For that reason, in this article, we’ll be talking exclusively about non-manual palletizers. Palletizers are used to repeatedly lift, rotate and wrench wood pallets and plastic pallets on their own. Regardless of the type, palletizers can perform a wide variety of tasks, ranging from metering products, to orienting the incoming load, to putting loads in rows and in layers, to transporting them forward or onto pallet racks. Our company has experiences dating back to 1937. We have taken various steps that have propelled us to become an industry leader. All of our products are engineered for advanced usability and longevity. Our teams utilize the best CAD technology to draft out the designs of our palletizers. All of these solutions come with worry-free installation and maintenance assistance. The capabilities of our company are unmatched. Rely on this progressive, well-established manufacturer of quality palletizers and more. 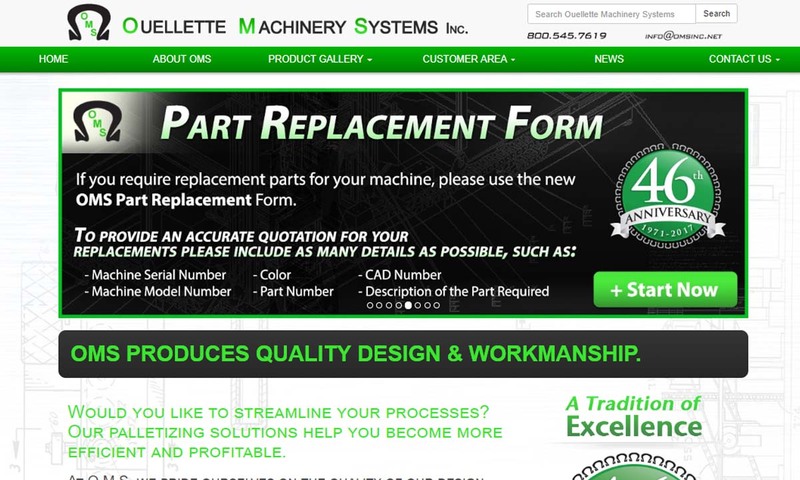 Since 1971, Ouellette Machinery Systems' focus has been to increase clients' productivity and efficiencies. 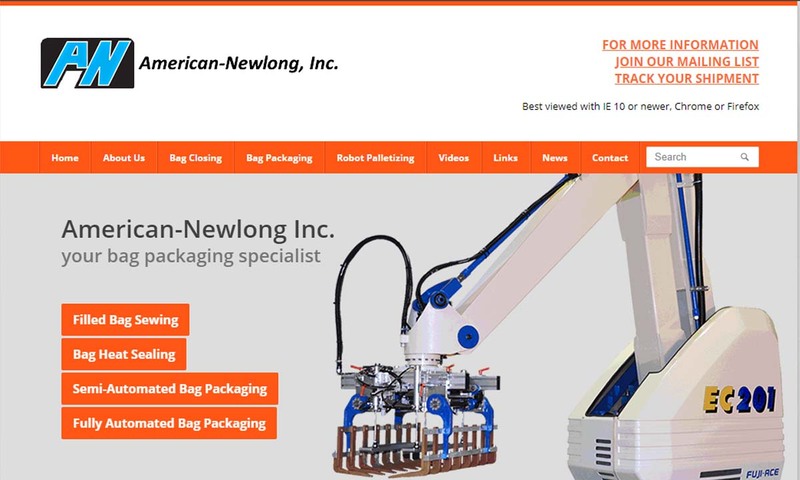 It is our goal at American-Newlong to create innovated bag packing and palletizing solutions. Our systems are ideal for industries including seed, feed, salt, minerals, aggregate products, pet food, chemicals and more. 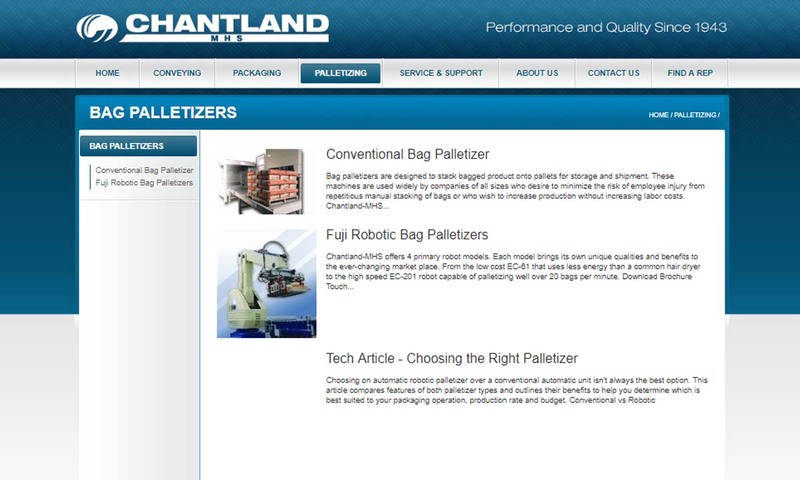 Chantland-MHS material handling equipment improves customers’ efficiency, productivity & competitive position worldwide. Put experience since 1943 to work for you; choose from a line of bag fillers, conveyors, palletizers & complete systems. MMCI Automation is a leading provider of intelligent material handling solutions. With more than 35 years of experience, we design, integrate, and install a full spectrum of robotic and conventional palletizing solutions. Pallets have been in use since the early 1920s. Previously, manufacturers packed goods in crates, boxes, barrels, etc. Before palletizers, workers stacked cases and other packages by hand. This worked for countless years, but with industrialization and World War II, production rates soared and eventually, workers simply couldn’t keep up. Plus, pallets were too large to move safely by hand. To solve this, Lamson Corp (now ARPAC) designed and built the first mechanized palletizer in 1948. Just two years later, engineers introduced row-forming automatic palletizers, which allowed workers to push goods into rows, then layer the rows, then move the rows onto pallets. By 1970, manufacturing was moving faster than ever, and in response, engineers came up with in-line continuous motion palletizers. These new palletizers used a continuous motion flow divider to guide products, thus speeding things up. To help keep loads stable, manufacturers in the 70s also started wrapping their product loads in stretch wrap. The next decade, engineers invented the robotic palletizers. The first robotic palletizer machines featured an end-of-arm gripper tool with which they could pick up goods, instead of just pushing them. Because they could pick up pallets, the first robotic palletizers also allowed manufacturers to start stacking pallets. This practice, which is standard today, contributes to modular design, saves space and makes it possible to store and move more goods. Also, today, pallet manufacturers often standardize their designs to work better with palletizers. 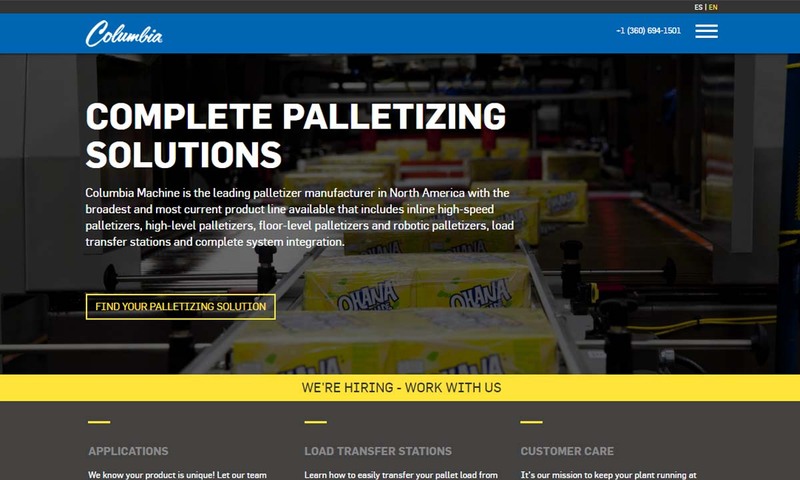 Palletizers – Ouellette Machinery Systems Inc.
Palletizers are divided into three main groups: robotic palletizers, low level palletizer and high-level palletizers. Robotic palletizers, which are automatic or semi-automatic, usually stand between a pallet dispenser and a pallet conveyor belt line that carries incoming products. The products are lifted and neatly organized onto a pallet by a hydraulic robotic arm, attached to suction cup arms or flat pincer arms. While robotic palletizers can only lift one item at a time, they are still much faster than their human counterparts, and they do not carry risks of fatigue or injury. 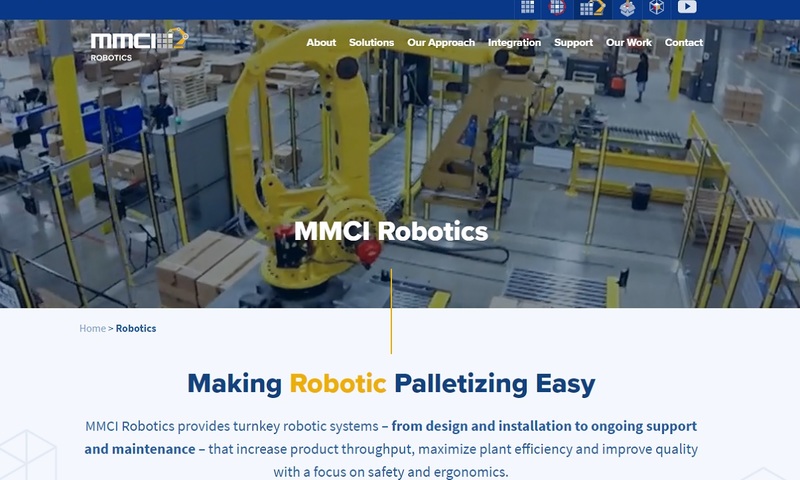 Robotic palletizers can handle both heavy and very fragile objects, and can be altered to accommodate different products, like pails, drums, bags, cases and bottles. In cases like these, robotic palletizers may be renamed after the product they load and unload. So, you may also hear the above referred to robotic pail palletizers, robotic drum palletizers, robotic bag palletizers, robotic case palletizers and robotic bottle palletizers, respectively. Other robotic palletizer varieties include articulated arm palletizers, selective compliant articulated robot arm (SCARA) palletizers and gantry palletizers. Featuring a jointed arm, articulated arm palletizers have a greater range of motion and flexibility for positioning than other robotic palletizers. Similarly, SCARA palletizers position products using a mast and cross arm. Gantry palletizers have capabilities that are enhanced by the addition of an I-beam or an overhead crane. Both low level and high level palletizers work with conveyors and a feed area that receives goods to be palletized. The difference between the two is that low level palletizers, also called floor-entry palletizers or floor level palletizers, load products from the ground level. High level palletizers, on the other hand, load products from above. In both cases, products and packages arrive on roller conveyors, where they are continuously transferred to and sorted on the pallets. These palletizing processes may be automatic or semi-automatic, but either way, both are faster than the robotic palletizing process. 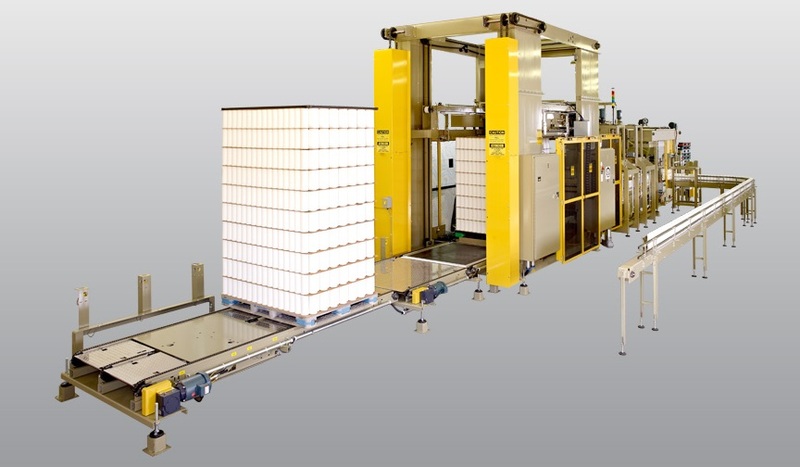 Another group of palletizing systems are in-line palletizer systems, which are systems designed to stack complete layers of bags or cartons at one time. Row stripper palletizers are a type of in-line palletizer that organizes a row then pushes it to the side until another row forms. The palletizer will stack row on top of row like this until a pallet is complete. Another type of in-line palletizer is the vacuum-head unit. Vacuum head units grab and hold onto items not with pincers, but with air-powered suction cups. After pallets have been loaded, they may stay on-site, in which case they will be called “captive pallets,” or they may be taken elsewhere. Most palletizer varieties include a combination of some of following components: an infeed, a row-former, a layer forming area, a discharge conveyor, a pallet dispenser, a robotic arm, a pallet station and a sheet dispenser. In addition, many robotic and automatic varieties come equipped with QuickSTOP collision sensors and Smartscan work cell perimeter guards. These measures not only increase safety, but boost productivity. Some large-scale centers also use depallatizers to unload packages, as well as equipment accessories like pallet dispensers, which are devices that dispense or feed empty pallets to conveyors, and load transfer stations, which are systems set up to transfer loads from one pallet to another without disassembling. Automatic and robotic palletizers have many qualities that elevate them above manual palletizers, such load stability, precision, operation speed and fewer associated worker injuries. They make moving packaged units much easier, safer and less labor intensive. Also, they make it possible to move more loads at once. Though the purchase of a palletizer is a large initial investment, its many advantages compensate for the cost many times over. For safety reasons, an AVG operator must be highly trained. A thoughtfully selected, carefully installed and religiously maintained palletizer will bring productivity to new heights. It eliminates most human error, injury and disruption-fueled profit loss, while speeding up and streamlining the process in general. For example, a lower employee injury rate, in addition to being good for morale and reduced workplace health coverage costs like Worker’s Compensation, reduces the likelihood of fines from the United States Occupational Safety and Health Administration (OSHA). As far as standards go, as we implied, it’s important that both your palletizer itself and the way you use your palletizer be in compliance with OSHA standards. Other American organizations that put out palletizer safety standards include: ANSI, ASME, UL, NFPC (Navy) and SAE International, to name a few. These organizations address various safety issues, such as fire safety, cargo restraint standards and conveyors. To learn the best standards to follow for your application, talk to your manufacturer. In the manufacturing industry, palletizing systems have become necessary equipment. However, as there are a wide range of palletizers available on the market, choosing a palletizing system becomes a challenging and time-consuming task. That’s why, before you go to a manufacturer, you need to be prepared with your specifications. Many consumer help blogs and articles concentrate on a number of factors to consider, ranging from reliability, speed, packaging options, machine type, loading capacity and size. However, the most important factor to consider is the speed, since it is what cuts the operation cost. What Affects the Speed of Palletizers? Since the advent of the assembly line in manufacturing, the goal has been to make processes faster and more efficient. This also applies in packaging, and inventors have come with a myriad of palletizers to automate stacking and packaging, including conventional and robotic palletizers. You may come across specifications saying speed, “up to 30 packages per minute” or something similar. This type of information is usually misdirecting, as there are a number of factors that decide the speed of a palletizer. To tell the speed of a palletizer, you actually need to know: product length, product per layer and product weight. That’s why, when designing a palletizer, palletizer manufacturers must first determine case length, cases per layer, cases per pallet and weight. Keep reading to learn more about product length, product per layer and product weight. The product coming out of the manufacturing process in the palletizing industry is also called a case. The length of a case affects the speed a palletizer, as it influences how many cases can be put in a layer in a conventional palletizer. After every layer, the layer forming operation is interrupted, as the hoist moves and the layer is stripped. The interruption can take a toll on the speed of a palletizer. However, in new conventional palletizers, the steps, including layer forming operations, stripping, and hoisting, occur concurrently to help solve this issue. However, these faster palletizers are expensive. This problem is not inherent in robotic palletizers. The length of a case does affect speed in robotic design too, though for a different reason altogether: The time is lost in the movement of the arm, which is why the pattern in which you layer your cases is as important factor as the length of a case. In conventional palletizing machines, if fewer cases are put in a layer, the hoist movement slows down the speed of a palletizer. Similarly, if fewer layers are formed in a pallet, it also affects the speed, since the pallet has to be moved and an empty pallet has to replace the pallet. As an alternative to this problem, high-speed conventional palletizers are available. The movement of cases in a conventional system relies on friction between the case and conveying system. The rule of thumb is the lighter a package, the probability that it will lead to jam increases. Even in robotic palletizers, weight influences the speed; however, the speed is hindered as the weight of the cases increases; robotic arms take more time to handle heavier cases when a vacuum cup is used to pick cases. With a better understanding of the influences on palletizer speed, you are now better prepared to make a good purchase. Even with the most thorough knowledge of palletizers, if you’re not working with the right manufacturer, you could end up with a very unsatisfying product. It’s extremely important that you take your business to a palletizer supplier or manufacturing company that is experienced and trustworthy. To help you find the best match, we’ve provided above the profiles of several palletizer companies we have found to be both knowledgeable and reliable. After you’ve gathered up your complete list of specifications and questions, check out the companies we’ve listed. Pick out three or four you believe provide services that align most closely with your needs, and reach out to them. Go over the points on your list with each of them. Then, compare and contrast their answers. Your goal is to find a manufacturer that cannot only do the job, but do the job with integrity, catered to your best interests.  Once you’ve determined which manufacturer that is, call them up and get started.